This may seem counterintuitive, but the front few rows at church are often the worst places to sit, at least for good sound. 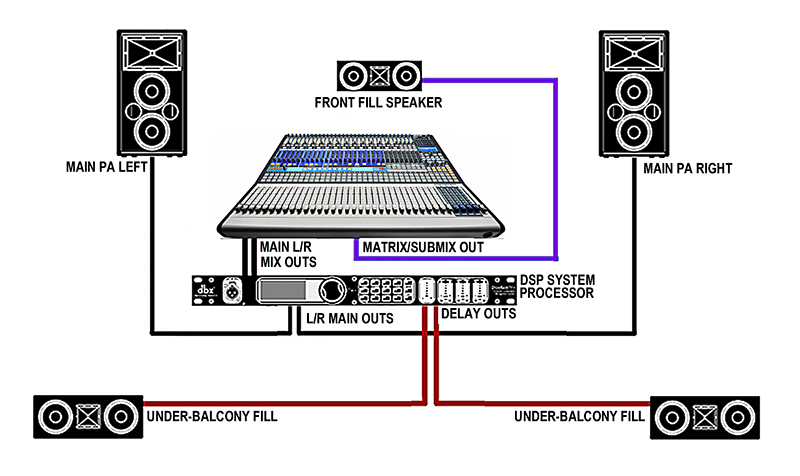 Seasoned sound engineers instinctively know that if they go to a concert, they want to sit as close to FOH as possible. The front row is cool to be close to your favorite artist (or pastor in this case), but the sound is often lacking. This can result in too much low-end, not enough highs, poor intelligibility and overall muddy sound. Aren’t these the prime seats? Shouldn’t the sound be good up there? Well it can be with some careful consideration of the need for front fills. If you want the ultimate control over the mix to your front fills, feed them from an aux, as you would a monitor mix. This will give you absolute control over every single input channel, and how much it is contributing to the mix. Just want to send vocals to your front fills? No problem. Want to send drums but at a lower level than everything else? Use an aux. If you go this route, plan on spending a lot of time dialing in your front fills to get them just right. Also, you’ll need to be attentive to the front fills every week if you change the instrumentation or change the number of vocalists. This method is not suitable if you are short on time or if you have an all-volunteer audio crew. I have to admit I’ve always found this approach too cumbersome and time consuming. Likely the most common way to drive front fills, the matrix-fed technique (shown in Fig. 1) is a good balance between ease of use and control. Sum the left and right stereo bus (and any other sources you need) into a single mono matrix and use that to drive your front fills. On a digital console, this still gives you a level of flexibility without having to spend time dialing individual channels into a aux. For example, if you’ve got a left/right system, simply sum the two into a mono matrix. But if you’ve got a left/center/right system, you can easily add in the center or mono bus into the matrix send as well. For a more complex scenario, you might choose to dial up subgroups of things like drums, guitars, keys and vocals at different levels to get your front fill mix just right, without having to dial individual instruments. You might even feed a little extra of some key input channels into this matrix to get the balance just right. If your church regularly uses volunteer operators, or if you just need to keep the system fixed and simple to operate, this might be your best choice. The level balance of front fills relative to the mains is delicate. If they are too loud, people’s attention in the front few rows will be drawn to the front fills as if their entire mix is coming from these little boxes on stage. If they are too quiet, the system will sound dull in the high-end, defeating the purpose of having the front fills to begin with. Having control over the front fills from the console is great, but it opens up that possibility that someone might mute them, change their level, or otherwise adjust something about the front fills that you spent a lot of time tweaking. One possible solution I’ve used is to handle the front fill send in the loudspeaker processor. The idea goes like this: In most cases, you are already sending stereo bus left, stereo bus right, and any other important mix buses from the console into the loudspeaker processor. Any modern processor will have the ability to take several of its inputs, sum them, and route them to an output. Let’s keep this simple. Say you’ve got your stereo bus left and right hitting inputs 1 and 2 on the loudspeaker processor. Program the processor to sum those two inputs and route the summed signal to an output which then drives your front fills directly (if they are powered speakers), or drives the front fill amplifier channel(s). By doing this, only people with access to the loudspeaker processor can change the relative level of the front fills. This also keeps things simple for your console operators. As long as they are sending something to the left and right, they are also sending to the front fills automatically by way of the processor. Whichever route you choose to go, use the most important tool you have, your ears. The front fills should be transparent in your overall PA system. If you walk down front and the front fills are very apparent in the overall mix, they probably need to be turned down. However if the front few rows still sound a bit dull in the high end compared to the rest of the room, maybe you need to bump the front fills up a few dB. So experiment a little: walk the room, listen and adjust accordingly until you are happy with the balance between the mains and the fills. Vince Lepore is the technical director at St. Luke’s United Methodist Church in Orlando and teaches live production at Full Sail University.